Left to right: Vanessa Taylor (The Shape of Water co-writer), Dee Rees and Virgil Williams (Mudbound), Aaron Sorkin (Molly's Game), moderator Jeff Goldsmith, Michael Green (Logan), and husband-and-wife writing team Emily V. Gordon and Kumail Nanjiani (The Big Sick). Photo credit: The Los Angeles Film School. 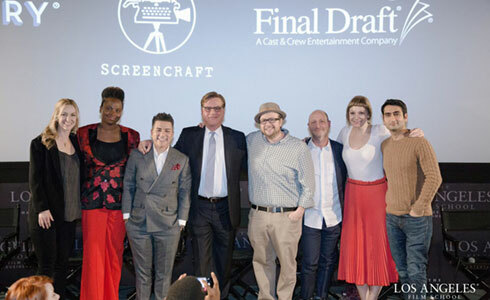 The Eleventh Annual Oscar-Nominated Screenwriters Q & A, moderated by Jeff Goldsmith, was held at The Los Angeles Film School on February 5. Best Original Screenplay nominees in attendance included Emily V. Gordon and Kumail Nanjiani (the husband-and-wife writing team behind The Big Sick) and Vanessa Taylor (who co-wrote The Shape of Water with its director, Guillermo del Toro). Goldsmith began by asking each to describe their lowest moments as screenwriters. Aaron Sorkin responded, "My lowest moment is now" which spawned laughter until he offered a clarification. "What I mean is when you've finished one thing, it's just back to that blank-ed cursor again. You get to be happy for about five minutes. You finish something and you're proud of it. It's good and it's landed with the audience and right now comes the moment [you think] 'I used every word I know. I don't have an idea for a story. This is it – now is when I get found out as a fraud.' So right now is when I'm not that much fun to hang out with." Kumail Nanjiani described how he and his wife excitedly presented their script to the producers and received copious notes in response. They drove home from Culver City to Los Feliz in stunned silence. Said Emily V. Gordon, "To get massive notes is discouraging, even when they're really good notes as these were. On any day I receive notes, I don't write that day. I just absorb them and write later." Michael Green offered this advice about notes that don't seem right to you: "Part of your job is defending your script from people who are good-intentioned but coming at you with other projects' problems because they have a history with them." Sorkin agreed. Goldsmith asked each of them what writing, music or other works of art inspire them. Dee Rees said she likes to read short stories. "I find short stories to be the most cinematic literary form." Among the writers whose short stories she mentioned were Edward P. Jones, David Foster Wallace and Alice Munro. Virgil Williams, who has a writing background in television ["Criminal Minds," "ER," "24"], answered: "As a TV writer, I don't have time for inspiration, but I like to be around things or places that take me back to the beginning." Gordon said she likes to re-read her favorite novels and is also inspired by music – recently writing to the score of Heathers. Nanjiani gets inspired by listening to the commentary track on movies. "You watch something thinking it's perfect and then you listen to the commentary [in which] they talk about all the decisions and hard work that went into it. It's really inspiring seeing the process that went into great work." For further inspiration, every year Nanjiani re-watches The Lord of the Rings trilogy and re-reads the screenplay of Michael Clayton. Others chimed in about the Michael Clayton screenplay. Michael Green: "If you haven't read Michael Clayton you aren't serious about screenwriting." Vanessa Taylor: "I come back to Michael Clayton a million times. It's almost like a compass, a reminder of what I aspire to, such a flawless, incredible script which, by the way, did not win the Oscar, of course, shockingly." Before becoming a screenwriter, Kumail Nanjiani was (and still is) a very funny comedian. His comic interjections made the highly informative evening all the more enjoyable. You can watch the entire conversation on Jeff Goldsmith's podcast.